When it comes to the world of business, Hong Kong is most associated with the finance. 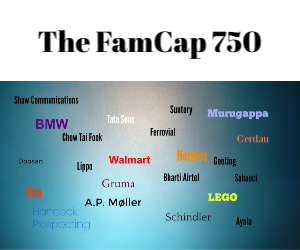 But it can also claim to have more headquarters of the top family businesses than any other city in the world, according to Family Capital’s 750 ranking of the world’s top family businesses. Hong Kong is the headquarters to 22 of the biggest family businesses in the world, including Jardine Holdings, Wharf Holdings, Li & Fung, and CLP Holdings. That compares with second-placed New York City with 18, third-placed Seoul with 16, and fourth-placed Paris with 15. When it comes to states and regions within countries, Germany’s North Rhine-Westphalia has a bigger concentration of family businesses than any region in the world with a total of 34. These include big names like the Aldi Group, Henkel, and Bertelsmann. New York state was the second biggest region with top family businesses, with 25. Another German state, Baden-Württemberg, was third with 20, followed by Bavaria with 19, and California with 18.